The Matt Diskin designed Kershaw Deadline has got a lot of special features between its two-toned stainless steel handles. First, there's the opening system. The Deadline opens with Kershaw?s KVT ball-bearing system. But a manual system like that has to have detent?often strong detent?to keep the blade in the handle until the user opens it. When the blade is fully closed, a depression in the blade is engaged by a ball partially embedded in the liner or handle. The interaction of ball and depression keeps the blade closed. The problem with that is that sometimes the detent is too strong to make opening the knife comfortable. The answer is the new Tuned Detent System. Both blade and handle feature a two-toned finish. In this case, Kershaw used grey PVD coating in the grinds and hollows and a satin finish on the flats. The 8Cr13MoV blade is a modified Wharncliffe with a top swedge. The handles are two-tone-finished steel with cold-forged handle texture for a solid grip. A strong frame lock secures the blade open during use. 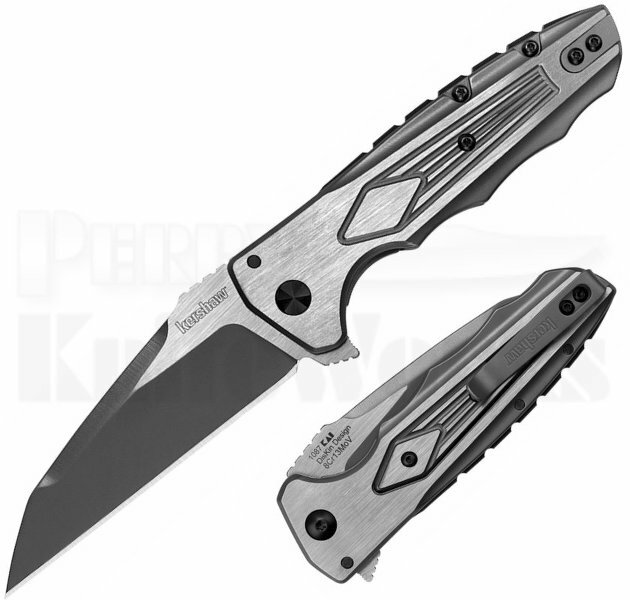 Kershaw also added a decorative glass-filled nylon backspacer in matte black and a moveable steel filler. The pocketclip is Kershaw?s deep-carry pocketclip.